Karma Thinley Rinpoche’s elegant dharma essay, ‘Telescope of Faith’ reveals radically differing ways in which the word “truth” is used in Buddhism and in science. In his essay, Rinpoche builds on the example of how western science, with its increasingly sophisticated telescopes, has been able to describe physical details of the sun, moon and planets beyond, with great accuracy. His thesis here is that, despite the superiority of science in terms measuring and so on, its scope is limited to describing appearances and their physical causality. On the other hand, the scope of Buddha’s wisdom encompasses and penetrates into the nature of reality in its entirety. Thus, he shows how that ancient wisdom provides a radically different, yet abiding, understanding of what constitutes truth within the Buddhist system of practice and thought. 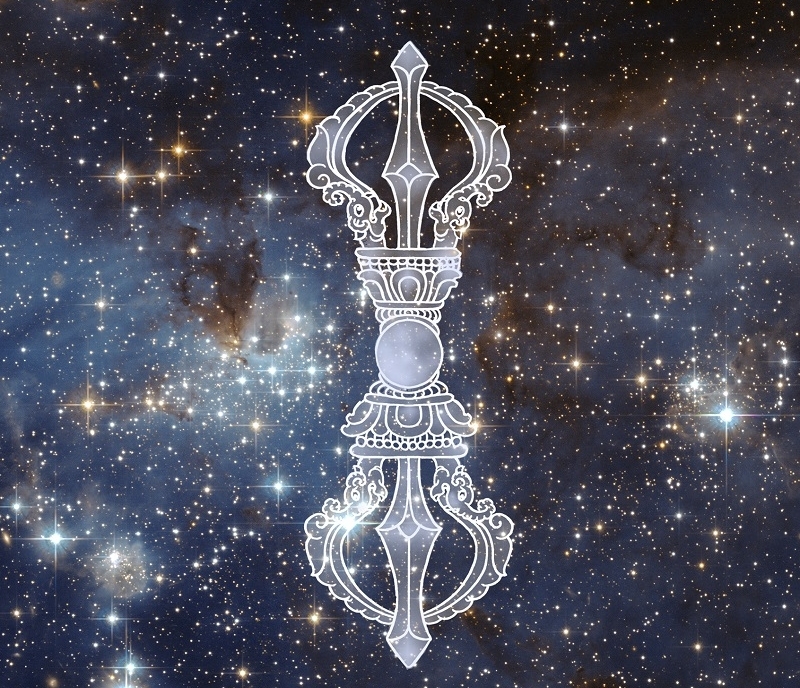 The cover of Lama Jampa's book, Diamond Sky, depicts a vajra superimposed on the background of a photo taken by the Hubble telescope. When Buddha Shakyamuni appeared in India two and a half thousand years ago, there was already a sophisticated cosmological description of the universe. For the Buddha, that cosmology was the scientific truth of the time, although not one that benefited from the exact measuring capabilities of the modern telescope. As Lama Jampa mentioned during a recent presentation and explanation of Rinpoche’s text, the nature of science is that theories are held to be true only until a better and more comprehensive theory can be established. That is what has happened in the case of cosmology, albeit over a span of thousands of years; the earlier Indian cosmology having been superseded by modern western descriptions and explanations. Since scientists continue to study the cosmos, in acknowledgment that there is still more to discover about the planets and the universe, it is clear that they have not yet arrived at any final explanation about the nature of the universe. Studying the dharma, we learn that Buddha taught what is known as The Two Truths, two ways that reality is perceived. These are firstly: conventional truth which is an accurate way of describing how appearances and phenomena manifest and function in the world. Then, on the other hand, ultimate truth that points to the ineffable, ultimately true nature of reality. There is no statement that can be made using conventional language that provides access to ultimate truth or that is able to define it. Therefore, in the context of the ultimate nature of reality, every single statement of conventional truth, in a sense, must be declared false simply because it cannot be said to be ultimately true. For example, if one were to test the assertion: “Reality is ultimately like an onion”, asking if that is true or false? The answer clearly must be false; as is every single assertion we can think of regarding the ultimate nature of reality, however sophisticated. There is, however, recognition in Buddhism that conventional truth has a practical purpose in the world even though it is not able to explain the true nature of reality. In his explanation, Lama Jampa mentioned, for example, the fact that scientists and engineers are able to develop aspects of conventional truth to great material advantage so that we are able reap the benefits of modern technology in our everyday lives. Buddhist teaching goes further than that in its application of conventional truth by making use of the Buddha’s enlightened discovery of how consciousness arises in humans and other beings. His discovery was not made by chance but as a result of a vow: the Bodhisattva Vow.He made this vow in an earlier life at the time of a previous buddha to dedicate himself, through a series of lives, to discovering the cause of suffering and to attain full enlightenment for the benefit of all beings, to free them from suffering. Born as Shakyamuni, he came to show beings the attainment of the state of enlightenment as complete fulfillment of that vow. .
Buddhist teachings known as ‘mind only’ describe how consciousness arises and how that arising operates to bring about a duality between ourselves, on the one hand, and that which is falsely apprehended as real and external to ourselves, on the other. Penetrating the cause of suffering, Buddha saw this duality as the factor which generates the defilements of desire, aggression and ignorance. Hence he was able to explain that it is these defilements, and their many variations, which are the driving force behind karmic actions that rebound on us as suffering. This has not remained as a mere theory, since the Buddha has provided us with a practical means - the dharma path - to dissolve this alienating separation and gradually open to realisation of the natural state where there is no duality: nirvana, peace. In the light of the foregoing discussion, this line can be understood to mean that the Buddha has fully recognised the ways that appearances of reality are misread by beings and taken to be truly existent, giving rise to emotions such as desire, pride, jealousy and aggression which are falsely taken to be an authentic experience of reality. In this way, the teachings make use of how reality is conventionally experienced by ordinary beings owing to our faulty reading of the true nature of reality. So, although the Buddha fully understands that our dualistic apprehension of reality is, in the final analysis, false, he has used the language of conventional truth to help us recognise our own misreading. This allows us to train to free ourselves from entrapment in the delusions in which we find ourselves as a result of the misreading. Rinpoche concludes that truth as understood through science does not refer to ultimate truth as found in Buddhist teachings; and even its body of conventional has quite a different purpose and scope than the body of conventional truth found in Buddhist teaching. Therefore, it would seem inappropriate to point a finger at scientists, saying their version of truth false, as long as they have no pretensions that science has the capability to reveal ultimate truth. Furthermore , it would seem ungrateful to point a finger in that way, since we all benefit from the findings of science in our everyday lives and many of their findings can be used by Buddhist teachers as material, just as Rinpoche has done here, to explain conventional truth aspects of the dharma. So, from a Buddhist perspective, scientific truth remains work in progress as a constantly modifiable subset of what we have learned through our study of the dharma to call conventional truth. As a postscript, it is noted that many practising scientists down the ages have also seen it, from their side, in a similar way. A contemporary example of this is seen in an article entitled ‘The Many Meanings of Truth’ published by a group of scientists at the University of California. This blog is the work of students in Dechen. Posts are typically a result of contemplation by its authors on teachings given by their Lamas. Whilst every effort is made to accurately reflect teachings given, any misrepresentation is entirely the responsibility of the authors. Please address any communication to blog@dechen.org.